I find that cauliflower is a highly underrated vegetable. In my opinion, when it’s raw it’s pretty blah, but as soon as you give it a nice roast it’s incredible. It is a great vessel for all sorts of flavours: in this case a buttery, salty, anchovy-based sauce. The sauce is called bagna cauda and literally translates to “hot bath” in Italian. It’s typically served on the side of vegetables as a dipping sauce. You can do the same if you like and keep the sauce separate from the cauliflower, but I decided to take the easier route and just pour all of the goodness overtop. In a food processor or using an immersion blender, combine butter, olive oil, anchovies and garlic. Place butter mixture in a small frying pan or saucepan over low heat for 15- 20 minutes, stirring occasionally. Your bagna cauda is now complete. 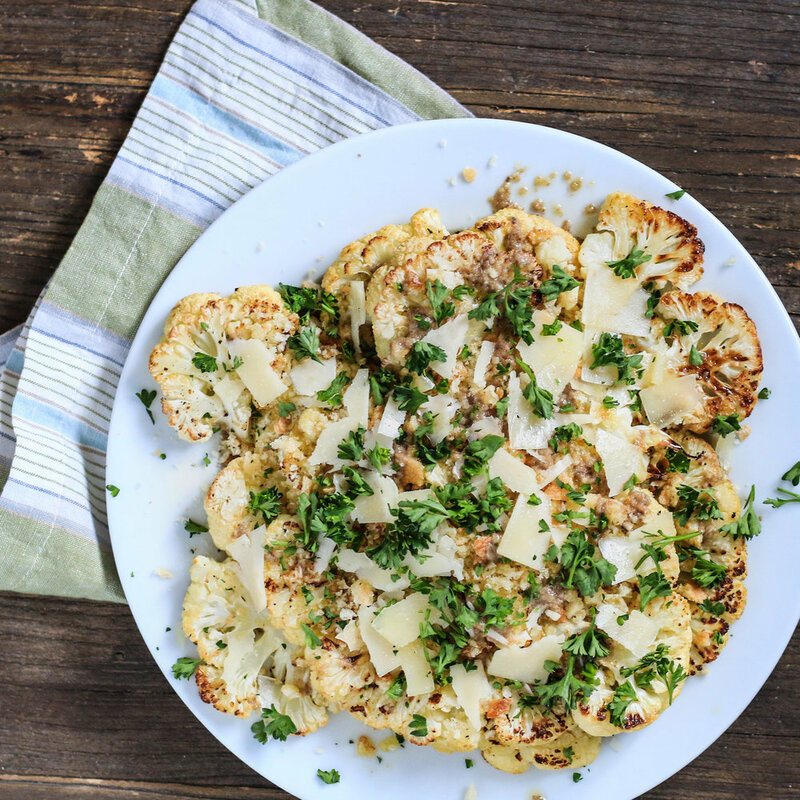 Place cauliflower steaks on a couple of baking sheets, arranging in a single layer. Drizzle with a bit of olive oil and season lightly with salt and pepper. Roast for 15 minutes, flip and continue cooking for an additional 15 minutes, until nicely browned. To serve, top the cauliflower steaks with the breadcrumbs and drizzle the bagna cauda overtop. Sprinkle with Pecorino Romano, chopped parsley and serve.